In the Healthcare Informatics solution provider market, there is a constant pressure to deliver more complex systems of higher quality and better functionality—in less time and using fewer resources. In reality, most of the healthcare IT solution providers are forced to spend a lot of time and effort on transaction-based customization request or maintenance services of their customers. As a result, their efforts on product innovation and product expansions take the back seat. Healthcare delivery providers are moving towards a more dynamic business enterprise and are eager to attain strategic initiatives because of increased cost and competitive pressures. In the industry, there is an increased focus on ICT investments by healthcare providers. It has become a necessity to balance the expectations and deliverables as healthcare is regional and not global. The needs and expectations from healthcare technology keep evolving, and the skills required to deliver healthcare informatics software systems continue to become more specialized & domain oriented. The need to be a competitive leader in optimizing cost of operations or in achieving operational excellence in improved patient care is now the main driver behind ICT system implementations. 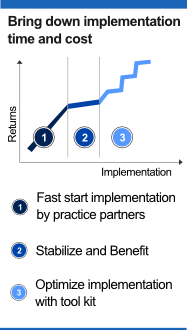 A healthcare informatics solution provider's goal is now to deliver solutions that not only solve specific problems but also provide healthcare delivery organizations with the highest possible Return on Investment and a strategic advantage among competitors. 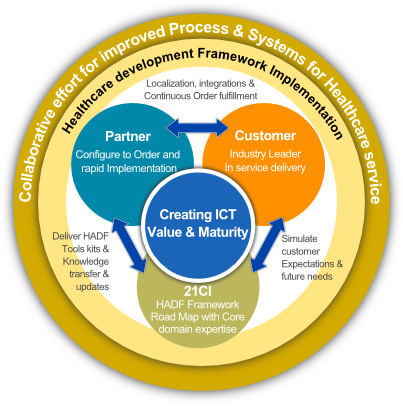 To address these pain points of the healthcare delivery organizations, the challenges of the ICT solution providers and with a decade of experience in understanding those issues, 21CI invested in R&D to develop the Health Application Development Platform (HADF). 21CI welcomes Large System Integrators, Healthcare Institutes and Consulting Houses to collaborate for joint value creation model and become a key stake holder in this transformation in healthcare, so as to enable the delivery to patients of services that are affordable, accessible and accurate. We understand that partners are a critical channel for leaving a lasting footprint and for our growth, and these collaborative value creations will contribute to our partners’ growth and success, as well as for 21 CI. What do practice partners do?